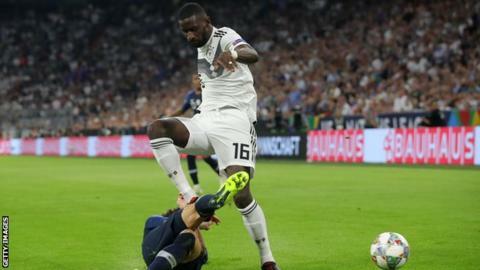 Rudiger caught World Cup winner Pavard, 22, with his studs during a sliding challenge in Thursday's Nations League goalless draw. Chelsea's Rudiger tweeted on Friday to say his challenge was not intentional. "I also want to use this opportunity to wish him a speedy recovery," added the 25-year-old former Roma defender. Pavard, who plays his club football in Germany with Stuttgart, was able to continue after the third-minute incident and completed the full game.